This dual-ended Micro Brow Pencil sculpts and tidies your arches with minimal effort. A well-shaped brow should elegantly frame your face and bring a make up look together without being too prominent itself – and this is the perfect product to help you achieve that effect. With a finely tipped crayon at one end and a spooley brush at the other, you can seamlessly define and tidy brows without the dreaded ‘drawn on’ effect. 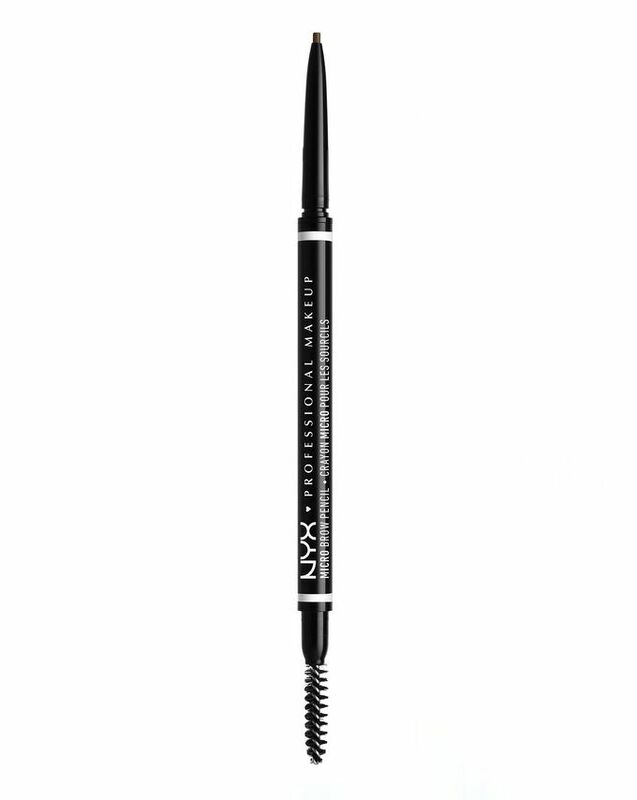 NYX Professional Makeup’s handy Micro Brow Pencil is essential for filling in sparse brow hairs and defining and tidying your arches. The skinny, mechanical nib can help you recreate the finest brow hairs, while you can use the brush at the other end to help tidy and blend your handiwork. With a natural array of shades to select from, you can fake bigger brows in an instant – plus the easy twist-up mechanism means you won’t need to hunt around for a sharpener either. I love this pencil, it is just pigmented and waxy enough to be easy to use. I use the shades ash brown and brunette - ash brown for a more natural look and brunette for a bolder look. Amazing! I’m kinda scared to say that it’s the best brow pencil I’ve used, ever, but I’m gonna say it. It’s long wearing enough to get you through a hot day and not too creamy.The shade ash brown is what I’ve been looking for, since everything else I’ve tried was too red or dark. It doesn’t make you look harsh either. Overall impressed! It’s ok but there is definitely better out there. If you want a good cheap option, then this is it. Taupe was a great match for me, and I liked the easy application. Goes on smooth, though it was a little sheerer than I wanted and I ended up applying more than I wanted to make up for it. I'll probably try something else next but it's OK for the price. The shipping of this item was really quick and only took up to 3 days, but when I used the product the pencil was fine but the spoolie smelt like something that came out of the garbage save your money an spend it on something else. I have used about 2 of these products and they are honestly my favourite eyebrow products. Love this pencil and this is now my favourite eyebrow product. Although the colour can sometimes be a bit hit and miss, other than that I love this product. I used to use the Benefit Goof Proof eyebrow pencil, but thought it was over priced so I tried this one and I will never go back. Seen so many good reviews and recommendations saying it was the same or better as the ABH one, really disagree, it doesn't show up very much so I have to use actually quite a lot of it to fill in my brows evenly so don't think it will last long. Also usually I do my brows first when I do my makeup but that's a pain with this product as any slightest touch with an eye-shadow or powder brush and it will rub off and go smudgy so I have to go over and over them for them to stay sharp and fleeky which is pretty annoying. For the price it's okay but £8 still isn't cheap. No value for money £8 but run out very quickly compare to others other wise good. I buy this instead of the Brow Wiz now as it's just as good and a lot cheaper. If you used the colour Caramel for the Brow Wiz, go for Taupe for this one. And be careful, the twisty 'thing' is quite loose, I ended up snapping a lot off. Just keep an eye on it. The colour didn't match what I thought the shade would look like. It didn't suit me at all, waste of money. The quality was ok. If you are on a budget and looking for a cheaper product this is a great one. The texture is alright, however it applied badly. I got it in blonde, and it was bright ginger! They should have a specific colour for that, not call it blonde. Does not stay on long, any slight touch and it's gone, however, It's a good value for the price. It's my go to brows. It's the third time I have bought it and I really like it: fast results, buttery enough to draw subtle lines. I don't like "solid" brows and this product, although not waterproof and not long lasting if rubbed off, works for me perfectly. Bought this as it was recommended to me, I must say I am extremely impressed, though it did run out very quickly. It's the only eyebrow pencil I've repurchased. A perfect dupe to the ABH brow wiz, however I don't feel like you get a lot of product for your money and it does run out quite quickly. Good brow pencil, more in quantity than the ABH and great payoff. Great brow pencil, works exactly the same as the more expensive Brow Wiz.